“What was the problem back there?” I asked the motorist who had sat behind my bike honking her horn. She said I’d been blocking the road. On a four-lane road, I pointed out, a cyclist riding a car door’s width from parked cars wasn't much of an obstruction. I also had as good a right as she to use the road. “You don’t pay road tax,” she answered. Roads were funded from general taxation, rather than a specific tax, I retorted – and, I added, no respectable transport economist believes motoring taxes cover all the costs of motoring pollution and other damage. As a higher-rate income tax payer, I was subsidising her driving. She changed tack. “F*** off back to Scotland,” she said – except that she didn’t use the stars. sharp-eyed readers will spot me towards the centre of the bridge. It would be tempting to describe my partner in this impromptu Socratic dialogue as typical of motorists in general – but unfair. There are, of course, many considerate, thoughtful motorists – it could hardly be otherwise in a decent, democratic country where cars account for the vast majority of personal journeys. But I have had enough ecounters with angry motorists – and read enough angry commentary from those exasperated with cyclists’ perceived shortcomings – to think that a sizeable minority share her feelings. I’ve seen no evidence attitudes elsewhere in the world are significantly different - and a fair amount that they’re much the same. The woman’s mentioning of my ethnicity was suggestive. Cycling may be only a personal transport choice – but her attitude towards me as a cyclist seemed of a piece with her casual racism. Her comment about my going “back” also illustrated the dangers of jumping to conclusions about someone based on limited information. I was, despite my accent, born in west London. Even if one accepted the dubious idea that only Londoners should be in London, I probably had at least as strong a claim on citizenship of the Capital as the Angry Woman of Camberwell. But the nature of some people’s feelings about cyclists is clear from what they write about us. In December 2007, Matthew Parris wrote in The Times that life in his village would be better if someone strung piano wire across the country lanes to decapitate passing cyclists. Cyclists, he said, were responsible for the litter found in local hedgerows because the litter was at cyclist, rather than runner, height. I’ve been trying ever since to work out how different a cyclist’s height is from a runner’s. Around the same time, a column in the Guardian – for which I can’t now find a precise reference – complained about cyclists in general and in particular their “pompous little plastic helmets”. In September 2009, meanwhile, James Martin – a TV chef –wrote a car review for the Mail on Sunday of an electric sportscar. Having mentioned in the piece his irritation at the number of cyclists riding on the roads in his area, he wrote about how he had seen two cyclists ahead of him when driving the silent car. He had, he wrote, deliberately accelerated as he passed them - then honked the horn. "The look of sheer terror as they tottered into the hedge was the best thing I've ever seen in my rear-view mirror,” he wrote. Matthew Parris’s column, the Guardian piece, James Martin’s car review and Camberwell Motorist all seem to express an anger out of all proportions to the anger’s stated motive. I had delayed the woman by milliseconds from reaching the end of a traffic jam. Even if cyclists had been littering in Matthew Parris’s hedgerows, it’s hard to see death is a reasonable punishment. Helmets are no more capable of pomposity than any other inanimate object – the columnist who imagined it was expressing only his own rage. James Martin seemed content to describe himself committing a crime against cyclists for no other reason than that they were there and vulnerable. Parris and Martin subsequently half-apologised by saying their columns had been meant as jokes. What comfort one is meant to draw from the idea that Matthew Parris thinks it amusing to imagine cyclists being decapitated remains a mystery to me, however. I still wonder which other crimes against fellow citizens the conservative, bourgeois Mail on Sunday would have regarded it as a joke for one of its columnists to describe. Such anti-cyclist anger reminds me in many ways of the feelings about gypsies that I would hear expressed when in lived in central Europe. In Hungary, people would tell me they disliked gypsies because they were lazy and dishonest. In Romania, some gypsy groups were unpopular because they were more successful than most Romanians, and built large, vulgar houses to show it. The truth was that gypsies – like, I would suggest, cyclists - were unpopular principally for being different. Humans seem to feel a rage against those who get away with things they long to do – with the gypsies for seeming carefree and unconcerned about bourgeois norms, with gay men who flaunt their feminine side, with cyclists for skipping ahead of them to the front of the traffic queue. It would be wrong to claim that cyclists – mostly, in London, articulate, middle-class men - face anything like the problems that the perpetually victimised gypsies or blacks or gays face. But I think the instincts have a similar genesis. None of this of course would matter much either if the sentiments expressed produced no real world consequences or if anything were being done to tackle the prejudices. Yet there are real-world consequences – and significant reluctance to tackle them. Days after Matthew Parris’s Times column, I was cycling out of Hyde Park across Knightsbridge one Saturday, heading towards home. Seeing me heading towards a cycle-only section of road, a young man on the pavement aimed a punch at me. He then guffawed with his friends at how his gesture made me wobble. I met Ken Livingstone, the then mayor of London, a few days later when he announced plans for what is now the London Cycle Hire Scheme. I recounted my story and asked the mayor how he planned to stop such – fairly common – behaviour from putting new cyclists off. He brushed it aside. “Well, I’ve often felt like punching a journalist myself,” he droned, before launching into the story of a constituent who, in his days as a member of parliament, had been seriously injured when knocked down by a cyclist. Cyclists, he seemed to imply – against all the evidence – were the real menace. 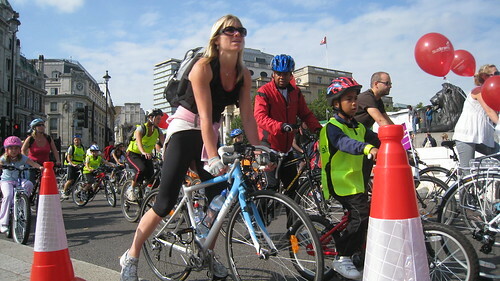 As long as veteran left-wingers like London’s former mayor continue to make common cause with the worst parts of the right-wing press and the least reflective motorists on cyclists’ rights, cycling in London – and many other parts of the developed world – will remain an activity for the determined few. When it becomes as unthinkable to joke about cyclists deserving death as it rightly is about any other group, tempers on the roads might less easily get frayed. It was the kind of reasoning you’d expect from someone who has spent so long trying to reconcile competing instincts and priorities that he’d lost all track of common sense. One summer several years ago, over lunch with a junior transport minister in the then UK government, I asked about the future of speed cameras - cameras for catching speeding motorists that his own government’s research showed saved more than a hundred lives every year. Putting on a serious voice and knitting his brows, the minister – who clearly disapproved of the official support for the cameras - told me that motorists were worried about speed cameras’ effectiveness because of the “regression to mean” effect. The effect describes how part of the fall in accidents at a given site after a camera’s installation is probably a statistical quirk, rather than a result of the camera’s presence. I tried – but didn’t fully succeed – to control my irritation. I told the minister – forcefully – that in my experience far more motorists were simply worried about being caught speeding. They didn’t have intellectual doubts about speed cameras – they just thought they should be allowed to drive whatever speed they damn well pleased. The minister clearly didn’t think it was important to enforce speed limits. 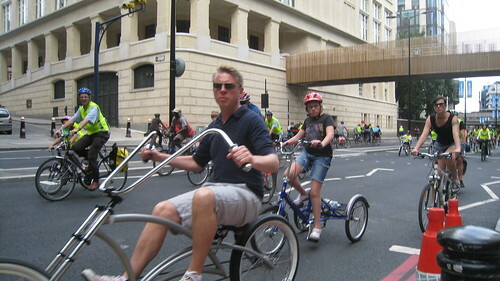 Cyclists on Lower Thames Street, London Skyride 2009.
yet they seem oblivious to the danger. The minister’s understanding for rule-breaking motorists did not, however, extend to cyclists. I went on to ask what the government was doing to make roads safer for cyclists. “To be honest,” he replied, “I think cyclists are their own worst enemies”. I had little doubt I had much, much worse enemies on the roads than myself – and I had encountered several even during my short cycle ride to lunch. I nearly – but didn’t quite – follow the inner urge to get myself out of the presence of someone who thought I wasn’t worth protecting. It would all have been less alarming if he hadn’t been the road safety minister. The lunch was the moment when I started to realise how completely the thinking about road use of most people – even those who devote their days to deciding on road safety policy – comes from the gut, rather than the higher brain centres. The minister’s gut wanted to drive fast – I later discovered he had a number of convictions for speeding – and disliked cyclists. My gut, clearly, likes cycling and doesn’t care for driving. But I like to think my frontal cortex at least gets to review the gut’s decisions. I recognised – I still recognise – that lots of people need to drive, that motor vehicles are not about to stop being the main means of making most trips in the UK – or most other parts of the world – and that even the keenest cyclist has to find some modus vivendi with the dominant road users. It was depressing to find a government minister relying so thoroughly on the lower reaches of his abdomen that he was holding two utterly contradictory views. But anyone who’s spent any significant time cycling anywhere where cycling is a fringe activity will know that cyclists scratch out feelings from well below some people's civilised veneers. Some motorists’ determination to get past cyclists just to reach the end of the traffic jam ahead faster; the curious determination of some pedestrians to step in front of cyclists even when they can see the cyclist clearly; the daily battles over precedence in the special boxes for cyclists at traffic lights: these all betoken a gut distaste for cyclists that doesn’t seem based on detailed perusal of road casualty rates. Nevertheless, it is probably worth laying out clearly how intellectually disreputable the minister’s views were. In 2010, 1,850 people died on the UK’s roads – and only four were killed by cyclists. In each of 2008 and 2009, only a single pedestrian died after being hit by a bicycle. Cyclists – who account for just under 2 per cent of traffic but far more in the urban areas where most accidents occur – consequently were responsible for just 0.22 per cent of 2010’s road user fatalities. The proportion had been still lower the two preceding years. Even among pedestrians – the only group of road users that cyclists seriously threaten – cyclists accounted for fewer than 1 per cent of the 405 killed. Other road users, meanwhile, killed 111 cyclists. These figures, of course, are rather as simple Newtonian physics would suggest. The energy released when a single cyclist hits a pedestrian at, say, 15mph and when a car, van or lorry hits a pedestrian at 30mph are many orders of magnitude different. I can testify to this point particularly congently after unwillingly conducting my own experiment in early 2009. On February 4, I was knocked off by a glancing blow from a minivan crossing my path on Brixton Road, south London. On March 13 the same year, I was hit squarely by a cyclist running a red light near Elephant & Castle. The minivan incident left me sore for a year – the collision with the cyclist only a few days. 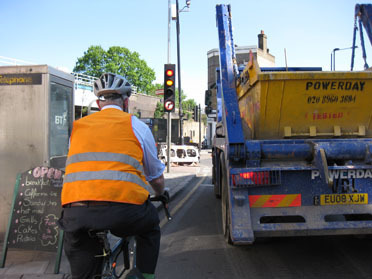 Cyclists running red lights, going the wrong way up one-way streets and mounting pavements are an irritation – but little more. Motorists who speed, talk on their telephones, fail to see red lights or deliberately drive dangerously regularly prove a lethal danger. Politicians who want to make life safer for pedestrians and other road users should consequently be encouraging cycling, even if cyclists continue to run red lights (which I think they shouldn’t) or mount the occasional pavement. We cyclists represent far less of a danger to other road users than any other form of wheeled transport. I am 1m 93cm tall and weigh 110kg – a weight that, despite my substantial height, makes the National Health Service think I’m nearly part of the obesity epidemic. Although I grew up in Glasgow, I have never, unlike most Glaswegian men, been addressed in the street as “Jimmy”. When you look like me, you’re “big man”. rear proves my essential invisibility. I am the vehicle on the left, if you can see me. Yet, surprisingly, I have a nearly infallible method of making myself invisible. 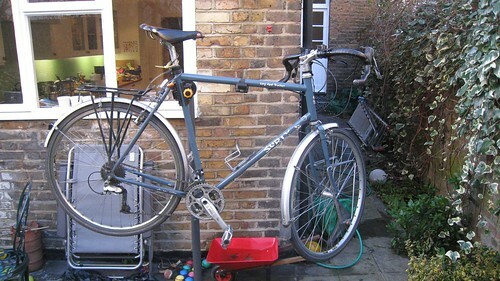 I put on a bright silver helmet, pull on a high visibility jacket, reflective wristbands and trouser straps, get on a light blue touring bicycle and head off down the road. My sudden invisibility has led me twice to be battered into the road by cars whose drivers claimed not to have seen me – and to have had countless uncomfortably close encounters with others. The snag is that, as soon as I in any way impede a motor vehicle, I not only seem to reappear but to assume for drivers proportions still larger and more lumbering than my real self. I’m suddenly an elephant, incapable of speed, out of place on an urban street and committing the unpardonable sin of Making a Motorist Moderate his Speed. I nevertheless, year in, year out, get on my bike on sunny days and rainy, when it’s freezing outside and uncomfortably hot, hunch my body over my drop handlebars and every year cycle around 4,000 miles – 6,400 kilometres. I am now nervous about any life change that might make me give this activity up. When it briefly looked as if I might move to Johannesburg, I seriously investigated the prospects for getting around one of the world’s most crime-ridden, sprawling cities by bicycle. Turns out it would have presented some problems. When I think about the possibility of moving to New York, I am, in truth, mainly day-dreaming about my potential cycle commute. 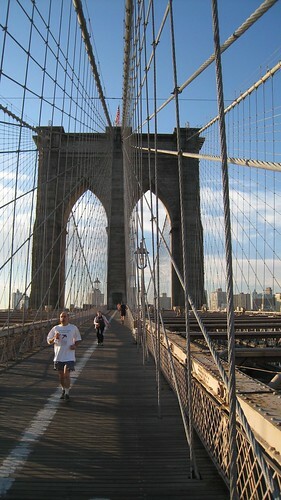 I walked over the Brooklyn Bridge once and want the film of my life to show me speeding daily along the cycle lane over that piece of 19th century engineering magnificence. I am a husband and a father. I am a Christian and, more specifically, an Anglican. I make my living by writing. But being a cyclist is no longer anywhere near as far behind those other core elements of my identity as a choice about personal transport ought to be. This blog is an effort to explain to some of the impatient motorists stuck behind me, puzzled friends and colleagues and - perhaps most of all myself - why that is. I hope along the way to provide some cheap entertainment – nearly all of it at the expense of my absurd self. The funny thing I’ve realised is that I don’t get much simple enjoyment out of cycling. My wife is endlessly frustrated at the number of times I arrive home jumpy or angry after some confrontation with a taxi driver or close shave with a motorist. I long to explain to some of them that a road lane with a cyclist in it is actually still occupied. On one memorable occasion, a bus driver assaulted me. Long story short, he hadn’t enjoyed being reminded that the special area for bicycles at many British traffic junctions is not intended for buses. The bad news for him: there was probably no other cyclist on that road that night who not only personally knew, but had the email address of, his bus company’s chief executive. I’m a cautious cyclist – a cautious person, in truth. I find the regular threats from such motorists a real and recurring source of worry. I wake sometimes in the early hours and go over incidents. What if I hadn’t managed to control that wobble? What if I hadn’t managed to stay just ahead of that motorist who deliberately drove too close behind me? What if I hadn’t controlled that skid? Will I one day feel my life slipping away, bathetically, as I lie on some piece of south London tarmac because of a BMW driver’s bravado? The thoughts gnaw away at my guts – and I gaze with incomprehension at my fellow cyclists who squeeze through the narrowest gaps, shoot lights or ride without lights. I’m constantly surprised at myself for tolerating far smaller risks. Not, of course, that there aren’t moments. My parents-in-law live in Cheshire and attend church 20km away in north Wales. When I set off at 9.30 on a Sunday morning, the main road near their house is quiet and straight. I can cover the first 12km or so at an average of 32kph. My body, normally so lumbering and clumsy, feels on a good day at one with the bike. It reminds me of a claim I once heard – whose veracity I’ve never established – that the bicycle is the world’s most efficient machine. So much of the effort I put in seems to turn itself into forward motion. 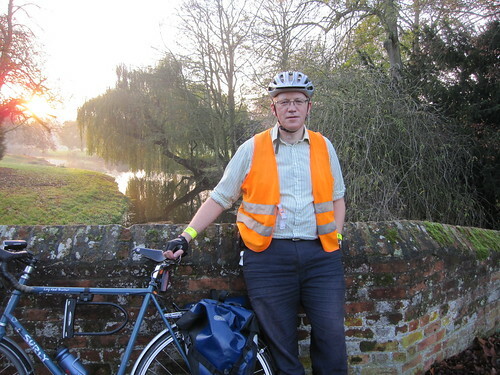 One warm day in 2008, I remember arriving in Ipswich from London on a train with my bike, heading for Felixstowe to undertake an interview. Told the train onward to Felixstowe had been cancelled, I had to cycle – and sped 14 miles on pleasant, quiet roads across the Suffolk countryside, feeling an entirely unanticipated lightness of heart. I experience a little surge of excitement when one company I regularly cover tells me it has an executive visiting London it would like me to meet. The meetings are always on the far side of Hyde Park from my offices and afford a chance – a legitimate chance, sanctioned by work needs – to speed along Rotten Row, a cycle and pedestrian path south of the Serpentine. Some of London’s best architecture fringes the park as I bowl along across the vast open spaces. Once a month or so, a day dawns clear, dry and bright and my morning ride to work passes in a surge of endorphins, my bike sliding smoothly around the traffic, unimpeded by motor vehicles and unharrassed by angry van drivers. I’ve become an inveterate cyclist partly, no doubt, because I’m chasing that feeling. To return to Pavlov’s salivating dogs, it’s well established that, when an animal receives a reward for pecking at a hole, pushing a button or whatever, it will keep doing so far longer after the reward stops if the reward has been intermittent than reliable. The insight explains the persistence of gambling and other kinds of addiction. People keep pursuing elusive rewards for longer than they do predictable ones. It’s the promise of another surprise, perfect run into work that keeps one slogging through the rain, confrontations with angry van drivers and sheer hard slog. But there’s more to it than that. I wonder, ultimately, if I’m really looking for fun in life. I think, instead, that I spend a great deal of time chasing the satisfaction of having put in an effort and accomplished something. It makes me work silly hours at my job, chasing the vindication of having beaten other newspapers to a story, seeing my name on the front page or simply having produced a nicely-crafted description of some unpromising container port or laid-up ship. It gives me a charmless earnestness I’ve been imposing on others since childhood. I recall being reprimanded by someone in my university hall of residence after I tried to start a conversation about some complex point of our moral philosophy course. It was, she remarked reasonably if a little snappily, breakfast. The need to put in effort sits conjoined in me, I think, with a need to engage with the world. I’ve had an impulse as long as I can remember to grab the world by the lapels and try to tell it about this new thing that’s happened, this new music to listen to, the way this ship works or God. Cycling ticks all the boxes for someone with such needs – and then some. The “I made it” feel on dismounting one’s bicycle after a difficult journey seems to be for me a more powerful reinforcer than the feeling of mere excitement after an enjoyable ride. The physical effort of shoving down with my thighs to slog myself to the end of some trip I should probably have undertaken by train soothes some deep anxiousness inside me. No-one can say I haven’t tried hard enough. When my need for such satisfaction is at its height, I constantly check the mileage recorded on my bicycle computer. I feel far happier and more content when my daily average cycling distance sits comfortably above 11 miles. The sense of engagement with the world – the wind in my face, the smell of the petrol fumes, the snatches of conversation from passing pedestrians – only heighten the satisfaction. It’s one of the factors that appeals to many people about motoring – the car’s ability to become a moving extension of one’s own home, cut off from those around – that most puts me off owning a car. The depth of this feeling struck me recently when on a cold day I found my hands unexpectedly warm in my full-finger gloves – the rarely-used cycling gloves that cover my whole hand. I was shocked at the calm I felt on switching to my normal cycling gloves, with cut-off finger ends. I could once again feel the wind over my fingers. I was in touch with the world. I believe in theory in doing things for good, positive reasons, inspired by rational thinking. There are rational reasons for cycling. I’m fitter than I otherwise would be, less prone to illness and pumping out fewer greenhouse gases into the atmosphere than a non-cyclist I would. But, when I wake up on a rainy morning with a headache in a foul mood, those positive reasons aren’t what count. 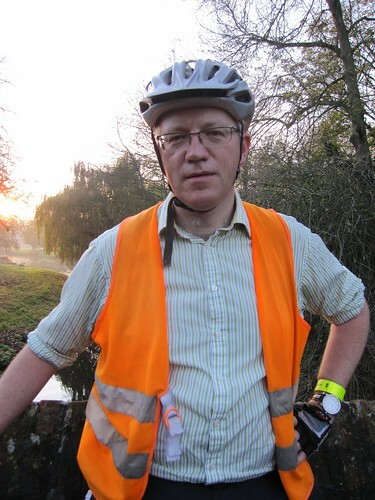 It’s the fear of losing those deeper satisfactions – the sense of having put in the right effort, the feeling of being in touch with the world – that get me out onto the road on my bike: the invisible, high-viz man.